Every now and then, we see a special edition for a game's guidebook, that comes packed with extra content. While it doesn't happen for every Assassin's Creed release, AC Odyssey will see a Platinum Edition Guide released by Penguin Random House. 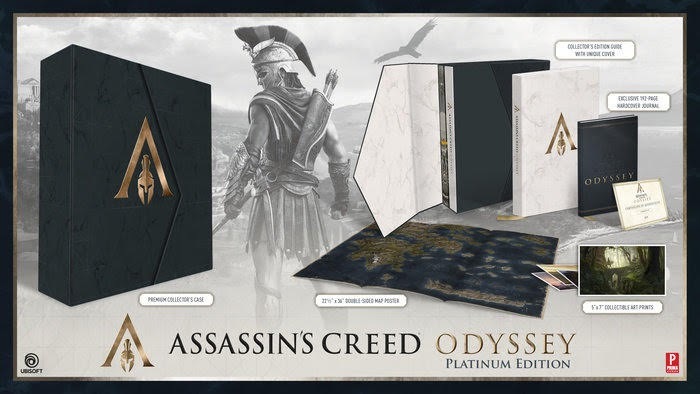 The Assassin's Creed Odyssey Platinum Edition will be releasing on Nov 2, 2018 and will come packed with the following goodies..
- 192 Page, Hardcover Exclusive Journal with a Ribbon Bookmark. - 22 1/2" x 36" Premium Double-Sided Poster printed on Premium Linen Paper. - 4 Collectible Art Prints measuring 5" x 7" on high-quality art paper featuring original concept art from the Ubisoft Quebec artists. - Collector's Guidebook featuring a Unique Premium Hardcover, crafted with foil & gloss accents, complementary endbands and a satin ribbon bookmark. Also includes a Digital Bonus Guide. It's selling for USD$99.99 and the quality looks really good. Very premium-looking stuff and I'm looking forward to the Concept Art prints as well. Ubisoft's artists always do an excellent job with their art and the Assassin's Creed games have always produced amazing-looking work. Who's planning to get this? !